The first and only expanded polystyrene roof insulation system that is approved by Underwriters Laboratories for installation directly over a metal deck without the use of a thermal barrier. The Styro-Stop Roof Insulation Systems meets U.L. 1256 fire testing for roof deck construction. This system provides the superior thermal qualities of EPS to give owners and contractors an economically logical insulation system for single ply and BUR application. 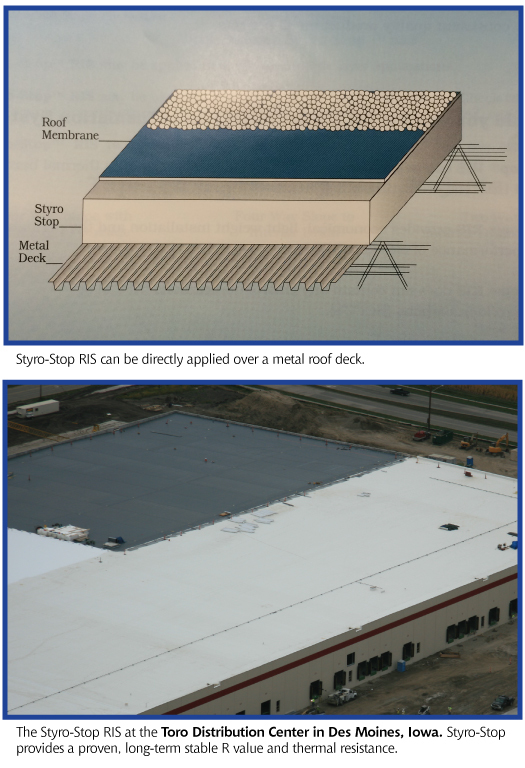 Styro-Stop Roof Insulation (RIS) is an expanded polystyrene roof insulation system that can be directly applied over metal roof deck. It may be used in a new and reroofing application with BUR and single pry systems. It is available for use in flat, tapered and compound tapered systems. Styro-Stop may have up to 7” thickness in flat applications and an average of 7” thickness in tapered applications.